Unique Perfume that Compliments You, Naturally. Home Fragrance, Bath and Body and Eau de Parfum from the Artisan Perfumers of London. Fragrant Botanicals and Scented Art. Bathing Gel and Bath Oils. A Sensuous Pleasure or a Treat for Somebody You Love. Naturally Pure Fragrance for Beauty in Wellbeing. Luxury Fragrances In Your Home and On Your Skin. Organic Bath, Body and Skin Care that Compliments You! Everything you need for your Authentic and Natural Wellbeing - Handmade in the UK ! An Authentic Perfumer's Collection for the Wellbeing of your Senses. Home Fragrance, Bath / Body / Skin Care, Eau de Parfum and Everything Perfume? Read moreHow Do You Describe Perfume? Why settle for a perfume that is available everywhere, advertised on TV, on tip of everybody's tongue or synthetically uniform? How does the Unique in You and Your Home flourish when the High Streets of London, New York, Paris, Bejing and Tokyo are eerily similar? We believe the fragrance you radiate is part of your Authentic Self and it needs care and attention to thrive in world of mass-manufactured and standardised luxuries. Unencumbered by the restrictions of mass consumerism, our Perfumer is allowed to recreate the 'artistry of the unique' in London through luxury fragrances. they adapt to your skin! Have you noticed how natural fragrances smell different from one person or home to the next? They become uniquely You! This is loss in modern prestige fragrances that are designed to smell uniform on everybody. we manufacture in old-fashioned batches! Our fragrances change from batch-to-batch, as the natural ingredients we incorporate change their profile according to the characteristics of the crop, just as wine changes from one year to the next. As London's Boutique Perfumery House, our inspiration draws naturally from the Essences of Life in this City. From the Royal Palaces to the Village Greens, from the Magnificent Parks to the Cottage Gardens, London is a bustling metropolis that has at its heart the sense of a village community. Our Inspirations come from the Orangeries and heady Flowers of Kew Gardens, the Victorian Bath Houses and Spas, the exotic spices and herbs in Fusion Cuisine, Afternoon Tea by the River, Strawberries and Cream during Wimbledon, the green aroma of Columbia Road Flower Market, the wonderful roasted coffee around St Katharine Docks, the smoky incense of Camden Town, the sweet antique woody note of the National Portrait Gallery and the richness of the spices floating on Portobello Road Market, ... to name but a few. luxury candles, reed diffusers, natural / organic perfumes, organic lotions and washes. We are one of the few remaining Perfumery Houses Worldwide that still have their own in-house perfumer, who takes great passion and pride in ensuring our products are an exquisite and luxurious creation: natural / organic, healthy, unique, artisan. London allows so many facettes to co-exist and flourish, while also fusing parts of them. Only in London, will you find the old and traditional beside the new and forward thinking, 'Fish and Chips' and 'Tikka Masala' on the same menu, the 'Shard' glistening across the river from the Tower of London, a Savill Row dressed gentleman crossing the same bridge as a lady wearing Street Style inspired by the London Fashion Week. Transform your Home into a Sensuous Haven of Boutique Luxury. Ingredients, e.g. natural / organic essential oils, flowers, bees, waxes. Be original in the choice of your perfume. Does your fragrance compliment you? 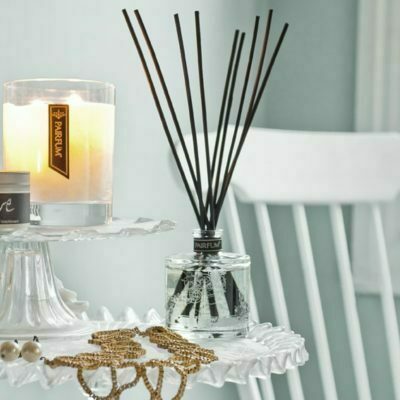 What sets our Natural Home Fragrances apart? Your home is a safe haven for you, your family and friends. A place to relax and luxuriate in but also where you celebrate some of the most memorable moments in life. This requires both Luxury & Health from a Home Fragrance. As London's Artisan Perfumers, Pairfum London combines Luxury in Fragrances with Health & Wellbeing in Room Perfumes. All of our Luxury Perfume Candles, Natural Reed Diffusers, Pillow & Sleep and Perfume Room Sprays, are not only natural & healthy to live with but also enrich your life at home with boutique luxuries. For Skin in desperate need of Deep Moisturising and Care. Our range of organic hand lotions, body wash, shower gel, hand wash, hand oil and body lotion ensure your skin is supple, smooth and beautifully looked after. True to our nature as London's Artisan Perfumers, our skin care products are offered in a selection of wonderful fragrances to leave your skin not only soft, pampered and youthful but also lightly fragrant. What is an Artisan Perfume? We believe Niche, Indie, Boutique and Artisan Perfumes are terms that are used broadly synonymous, i.e. they all describe the same.